As much as people would like to think so, church is not some magical place immune to violence. Psalm 144:1 Blessed be the LORD my strength which teacheth my hands to war, and my fingers to fight. Isaiah 10:15 Will the axe say high-sounding words against him who is using it, or the blade be full of pride against him who is cutting with it? As if a rod had the power of shaking him who is using it, or as if a stick might take up him who is not wood. You could just as easily found quotes from the bible to support, nay oblige the killing everyone inside the Church. Isn’t this the same God who condones genocide? I really don’t think he has a beef with guns. those who beat their swords into plowshares shall be ruled by those who don’t, so go buy yourself a sword. Fools. I’d point out that good people will obey that silly sign, and the bad people you need to worry about, won’t. And you won’t have any of the good people around who might have helped you then, either. It’s your funeral, as they say. Where else can you find a few hundred people with their backs to the door. Thats why the Preacher should put a gun behind the Pulpit, because he would be the only one looking that way. Apparently someone at that church thinks we are living in the millennial age where Jesus has returnee to rule over the earth from Israel and there aren’t any need for weapons at that point. Well, at least criminals know everyone there doesn’t have a gun. Churches and holy grounds aren’t immune to violence. My uncle goes to church armed…because the only car break in he’s ever had, was in the parking lot of his church. Oh and PS, a plowshare could probably be used to hit someone. Better question: Why would you want a bunch of plowshares in your church? Trolololol. In some states signs like this are binding in that if the owner or an employee finds out you have a ‘weapon’, they can ask you to leave and if you don’t go, they can call the cops and make you go. In my home state, these signs are not binding in any legal sense, though the management can ask you to leave for carrying, and it’s probably best to just go if you’ve been “caught”. Once, I was taking my grandpa to the grocery store and there was a big fat sign on the front door. It showed a stainless Beretta 92 with the circle and line through it, but no words of any kind. I thought to my self “The sign clearly says “No Beretta 92s””. I was carrying an M&P9c and didn’t figure the sign applied to me. Also, since I’m not retarded, no one figured out that I was carrying. You are correct, sir. However, only certain states (MO comes to mind) can assess a fine based on your carrying in a shop/private property where it is forbidden with an approved sign. Anyone can ask you to leave, but it isn’t technically a criminal trespass until certain other criteria are met (at least in the state where I was a cop). NC too. The property owner can post no CCW, and ask you to leave if you’re carrying. Which is why most of us don’t go to posted businesses. I have been known to call them up and thenk them for accepting unlimited legal responsibility for my safety while I’m on their premesis, though… amazing how quickly those signs get rethought when that tidbit gets pointed out. The shul I go to doesn’t allow firearms, because there is an armed guard and that is considered “sufficient”. Obviously the people in charge have no regard or skills in strategy. That lard really helped y’all out. After reading a story about how a doctor who preformed abortions had a man walk up to him, in the middle of a church service, and execute him in his pew, I think it should be a necessity to carry guns to church. Religious extremists of ANY religion can be dangerous. Here in my home state that sign would be legally binding; we can only carry in churches with the consent of that church. Personally I’d exercise my right to worship in another church. We have a police officer who patrols around the premises during services, which is an excellent thing to have. However, it’s my preference to have armed personnel s who don’t necessarily exude deadly force walking the premises as well. I am so glad my church is cool with concealed carry. Heck, just about every Sunday after the sermon it’s Gun show and tell in the parking lot! Hmmm… If the church won’t respect the second amendment, why should it benefit from the first, and the tax exempt status that it receives? I’ve seen enough churches that look like royal palaces to make me think religion has become a money making enterprise for many. Interesting point, Josh. I’ve never considered that before but is an excellent question that I’d love to see directed at the administrators in the building where that sign was posted. In Texas that sign would be nice and all, but not binding on anyone. See Texas Penal Code section 30.06 (heh, I still snicker when I think about that) which states that a person has to be told, orally or via sign at the entrance of the building stating “Pursuant to Section 30.06, Penal Code (trespass by holder of license to carry a concealed handgun), a person licensed under Subchapter H, Chapter 411, Government Code (concealed handgun law), may not enter this property with a concealed handgun.” This sign must be in both English and Spanish, at least 1″ letters, and in contrasting colors for it to be valid. I am also here in Texas, thank God, and the “no beretta” silhouette sign is pasted on my local credit union’s front door. I asked the manager about it. She said the facilities manager from headquarters required that exact sign, and that several tellers had asked her about it as well. Which tells me there are CHLs among the tellers there! So +1 for my credit union! They know how to make anti-gunner “feeeeeeeeel” all good about themselves, while allowing licensed law abiding handgun carriers to continue going about their lawful business. As a Christian, and one who frequently attends church, I see it my duty to be able to defend those who cannot. Some may argue that even though I know where I’m going if I die, the attacker may not. I argue that with not knowing the attacker’s intentions (even if he’s stated his intentions how is he believable). He may intend on killing as many people as he can, people that may not be prepared to meet their Maker. I would rather risk sending a murderer to meet God than have the murderer send many more (who aren’t murderous) to meet God who just might not have come to the point of salvation. My pastor and I probably disagree with each other on this topic, but some pastors see it differently as I do. If my church put this sign up I would still carry into church and I believe others in my congregation would too. The verse is also taken out of context. Isaiah 2 talks about God judging the nations and the nations making their swords into plowshares. It’s not the church’s job to make plows, or make others make plows, especially out of swords/guns. Doug, I agree. As a Jesus follower and a former Youth Pastor I believe that it is not only my right but an obligation to protect my family and others if the occasion arises. Paul writes that, “As far as it is up to you, live at peace with others.” I take that to heart, I don’t go looking for trouble and I treat others with respect but if evils comes to my doorstep I will do everything I can do to protect mine. 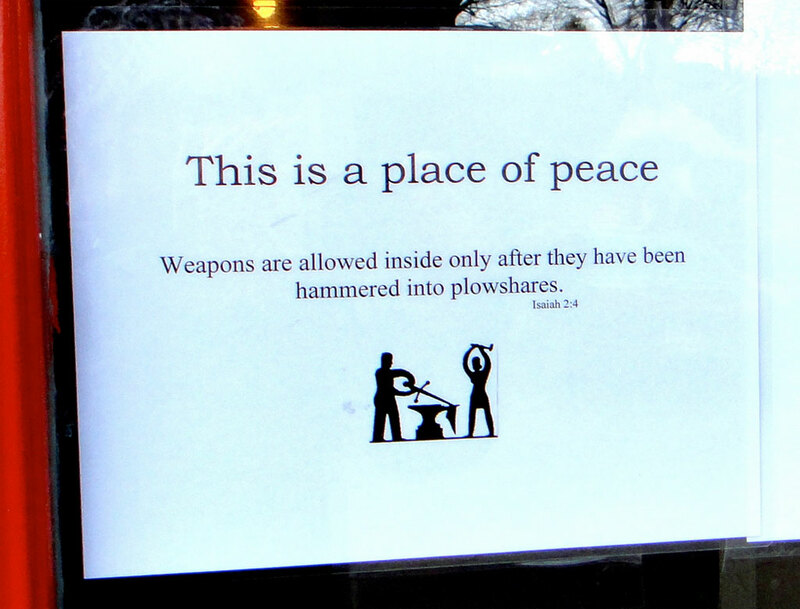 Churches that take the pacifist stance obviously missed the Old Testament. I don’t want to go into a long theological discourse but Jesus was not the meek and mild man that so many believe him to be. He was a peaceful man but he was known to toss a table or two when needed. Well said. Nehemiah also threatened people that were corrupting the Israelites when they were rebuilding Jeruselam that he would “lay hands on them” if they continued to do evil. I want to walk in there with a plowshare slung over my back. I’d love to see the looks I get. That would be fun, but not fun enough to get me to go to church. As a Church-going man myself I can say that most Churches allow concealed carry and even open carry. People should rely on God to protect them, but sometimes he uses someone like us instead of a lightning bolt to take care of the baddies. Basically don’t pray for God to save you from drowning and then refuse the guy in the lifeboat’s help. …don’t pray for God to save you from drowning and then refuse the guy in the lifeboat’s help. There is an old joke about a guy on his roof in a flood, who refuses 3 peoples help (a car, then a boat, and then a helicopter). When he gets to heaven (after dying) he ask god why he didnt save him. God says “I sent you people to save you 3 different times”. AKA: A biblical example of lawful self defense. With Jesus about to leave, the miraculous power that had spared the Apostles from harm would be leaving, and it is customary to defend oneself, especially when not in Judea. The great thing about the Bible is that it seems that for nearly any controversial issue there is support for both sides of it. If you don’t like what the Bible says about an issue, just keep reading and you’ll find support for your position. Not really, context is key, the vast majority of Bible verses cannot stand alone. Anyone can take one verse out of context to support their belief. That’s how cults start. I tried beating my Glock into a plowshare, but all I got was a mess of mashed-up metal and some broken shards of polymer. Couldn’t plow so much as a flowerpot with it. See, you’re doing it wrong. You should be pointing the Glock at some other mook and making HIM plow. No no no. You shouldn’t be using the kind of plow that uses a plowshare anyway – they turn over too much topsoil and lead to terrible erosion. Keep it up and all our fertile farm land will be in the Gulf of Mexico. If you’re going to till your field, use a chisel plow – which uses little arrow shaped things called “sweeps,” or a disk ripper – which uses a combination of disk blades and several long tines that penetrate the ground with “shanks” attached to them. The pastor who posted this sign must have no concern for our environment and the ground that produces the food that he and his congregation eats. Environmentally insensitive prick. Eric Shelton did a good podcast on this subject, Handgun Podcast # 129. Out of couriosity, where was this church from, and was denomination is it? I used to listen to those too. He may be doing some more… I heard his girlfriend talk about it on the Gun Dudes. Churches are not safe from violence. If you don’t think a metal plowshare is a weapon, you haven’t been paying attention. It’s not a great weapon, not my first choice, but I sure don’t want to get attacked with one, how about you?